When you’re in need of German auto repair, it’s crucial you take your car to a mechanic that knows your make and model vehicle. There’s nothing worse than dropping your car off at an auto repair shop to only hope the best outcome occurs; unfortunately, this isn’t always the case. Many car owners make the mistake of taking their car to a dealership to have work done; or worse, an auto repair shop that doesn’t specialize in the make and model vehicle you own. When this happens, you aren’t sure what price you’ll pay or the quality of work you’ll receive. So, if you’re searching for an auto repair shop in which to take your German car too, you’ve found the right place. We have all been there; our cars have needed a repair or service that keep them running smoothly. We drop off our cars at the local auto repair shop and pick it up later in the day to be left paying hefty service and repair fees that leave us feeling like we have been jipped. Does this sound familiar? Know the services you need by taking your car to a German auto repair shop and pay a price that’s fair, competitive, and one that isn’t making you feel like you just got ripped off. #1 Research what you need. Do all of the research you need to make sure you’re getting a repair that’s justifiable. Get a second opinion if you’d like. Give our German auto repair experts a call. Whether you spend a few minutes researching or a full day, if you determine what you car needs, you’ll get a variety of search results. For example, if you complete a Google search with the phrase, “Recommended servicing at 30,000 miles,” you will get a number of search results providing you with the types of inspections, services or repairs you may need. For more details, you can check out your car manufacturer’s website. #2 Print off and be aware of competitor coupons. At times, you can save a few bucks that add up quickly on services and repairs. Many auto shops and service centers offer competitor coupons, even if they aren’t advertised. Make sure you give us a call to learn if we have any competitor coupons you need. We’re always happy to give you our business, and we’ll do a lot to make sure that happens. #3 References are always important. We’ve said it time and time again, call and get references. Word of mouth referrals means the most. You know the German auto repair technicians have to be good if they’ve received service and are telling you to trust them, and they’ll be less likely to rip you off knowing that you were a referral. In our book, it’s a win-win. #4 Don’t fall for the “too cheap to be true” scam. You’ve probably seen them, you know, the coupons that say you’ll save 50 percent or more on a certain service with their coupon in-hand. These gimmicks are ones that get you into their auto repair shop to “up-sell” you unnecessary service and repair deals your car doesn’t need. If you believe the deal is too good to be true, it’s probably because it is. If you want to use your 50 percent off coupon, call around to other services and repair centers in Denver to learn if their coupon price is comparable. #5 Don’t believe everything that you have been told and be firm. We believe this is one of the most important tips to making sure you never get ripped off. Don’t believe everything you’re told by a sales staff you don’t fully trust. Many companies throughout Denver operate on parts and service commissions, which means you have a high chance of getting ripped off by being sold extras your car doesn’t need. So, before you make an appointment for a service or repair, be sure you know exactly what you need and keep what we said in mind. If you aren’t sure you do need the services or repairs they’re recommending, do your own research and tell them you’ll get back to them at a later date. 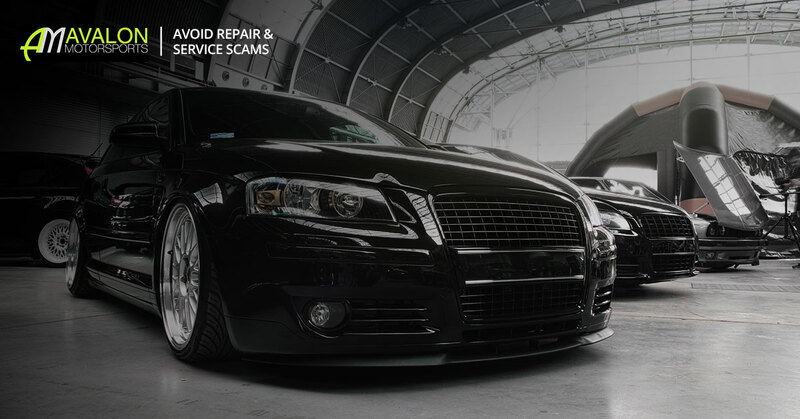 There are plenty of ways to avoid getting scammed when choosing a German auto repair company in the heart of Denver. Contact the specialized German leaders in the industry today and learn why we’re the best. As always, if you have any questions, comments or concerns, please don’t hesitate to reach out to us. Our technicians are standing by stand by your side and give you the customer service you deserve. If you would like to learn more about Avalon Motorsports’ German auto repair capabilities, visit us online here.